We will present vibrant and accessible programs that bring the Old Treasury Building to life, contribute to community connectedness and inspire a sense of place. We will safeguard the Old Treasury Building for the people of Victoria and others. We will create a lively and welcoming museum that tells engaging stories, contributes to the cultural vibrancy of the city and is a leading cultural heritage destination in Melbourne. The Old Treasury Building Reserve Committee of Management is a body incorporated under the Crown Land (Reserves) Act 1978 appointed to manage issues relating to the areas of the Old Treasury Building Reserve pursuant to its powers under the Act and the Crown Land (Reserves) Regulations 1999. These powers include but are not limited to powers to issue permits for specified purposes; powers to set aside specified areas of the Reserve for parking and other uses; and powers to manage the safety and security of the Treasury Reserve. The role of the Committee includes, but is not limited to encouraging greater public access and appreciation of the Old Treasury Building; ensure that the Old Treasury Building’s architectural heritage values and contents are preserved and maintained; and ensure that any alterations and additions, including signage, in the Reserve are tasteful and sympathetic to the architecture and heritage of the Old Treasury Building. The Committee approves in principle works to be undertaken on the Reserve and relevant publications. The Committee operates in conjunction with, and uses the resources of, the Department’s Government Services Division regarding works to be undertaken on the Reserve. The committee meets 4 times per year. The Old Treasury Building is a registered charity with the Australian Charities and Not-For-Profit Commission. The Old Treasury Building is a member of the Collins Street Precinct. A dynamic partnership with Public Record Office Victoria (PROV) gives the Old Treasury Building access to the state’s archival treasures for use in exhibitions. Documents held in the state archives vary enormously, from records tracing the physical development of the state, including early land sales and the growth of manufacturing industry, to documents reflecting changes in the lives of Victorian people, from the beginnings of European settlement. A wonderful photographic archive charts the growth of the state in pictures. 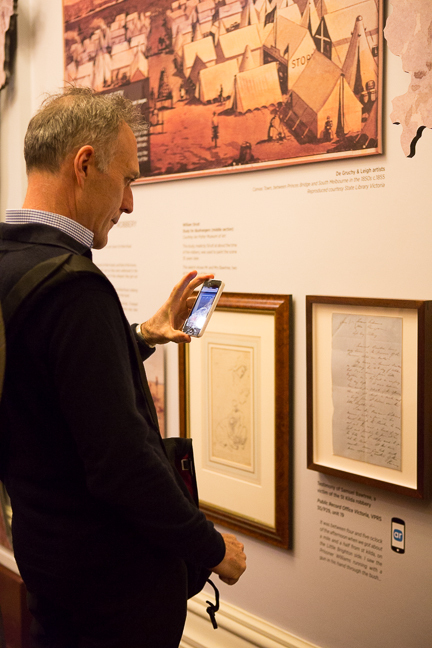 The Old Treasury Building develops a regular program of exhibitions in partnership with PROV, including both long-term and temporary exhibitions. Find out more about these exhibitions on our What's On page.